Dan Allan talks about how to stay fresh in ministry during the East Focus Retreat. After a rainy Monday, the skies were clear and blue during day two of the East Focus Retreat, which is being held through tomorrow at Ocean City, Md. The event, which began late Monday afternoon, is for Grace Brethren pastors and ministry leaders and is being led by Clancy Cruise, executive director of the Fellowship of Grace Brethren Churches (FGBC) and pastor of Marysville Grace, a Grace Brethren congregation in Marysville, Ohio. Dan Allan, pastor of Grace Brethren Church, Ashland, Ohio, kicked off the morning session as he shared ways to stay fresh in ministry. As he did at the Central Focus Retreat several weeks ago in Ohio, Allan shared three points: lighten the load, look to Jesus, and lower your expectations. Scott Becker, left, shares how Grace Church, Lancaster, Pa., sought help from Grace Church, Lititz, Pa.
Later in the morning, retreat participants broke into their small groups to discuss Allan’s points and to share more about mentoring relationships. 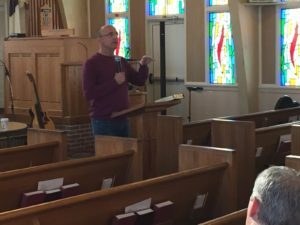 Also on Tuesday morning, Scott Becker, campus pastor of Grace Church, Lancaster, Pa., told about how the church was relaunched as a campus of Grace Church, Lititz, Pa. The afternoon was free for a variety of activities. Some played golf, others rested or read, or found other recreational activities. Dinner was on their own, taking advantage of the many restaurants in the area. Tonight, a panel of church planters and those representing new congregations or church-planting organizations, shared updates on a least ten developing churches in the FGBC. They included Scott Avey, planting a church in Brunswick, Md. ; Dustin Godshall, who helped breathe new life into the Grace Brethren Church, York, Pa.; Jack Brown, executive director of Grow New England, who has a vision for new churches in the Northeast; Dario Agnolutto, pastor of Grace Brethren Church, Owings, Md., which is planting a church 25 miles to their south; and Nathan Bryant, executive director of Assist Church Expansion, who shared about developing congregations in Chelsea, Mich., Gahanna, Ohio, Kendallville, Ind., Cambridge, Ontario, and Mayfield West, Ontario. Church planters and others representing new congregations reported on Tuesday evening. The group then spent some time in prayer for these church plants before disseminating for the evening. 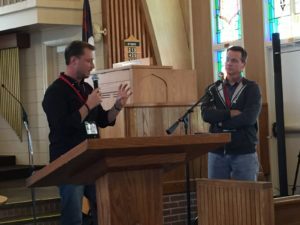 The retreat concludes tomorrow as leaders of the Association of Grace Brethren Ministers, Mark Lingenfelter and Matt Wheelock, share the standardized ordination process that the organization is recommending to be used by local churches and districts in the Fellowship of Grace Brethren Churches.